She crocheted me this beautiful thread bookmark. The beads are wonderfully weighty, so they make a satisfying clink when you lay it on the table. 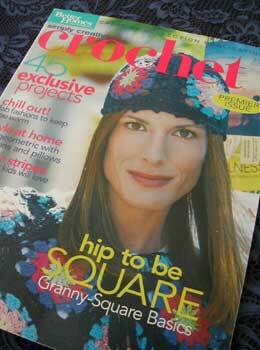 And she was very sweet to send me her only copy of BHG Simply Creative Crochet from 2003. I was enormously happy because it’s so hard to find a copy of it now. I think my favorite patterns in it are the Diamond Tunic and Elegant Wrap Cardigan. When Julie sent the mag, she slipped a Beware of the Crochet Lady sticker in the package. Love it! I’ll have to take a pic of it on my truck. What a hoot! ;-) Thank you for everything, Julie! What a beautiful bookmark! I really liked that magazine. In fact there is a new issue out now that has some great patterns. You lucky lucky girl! The bookmark is beautiful :) And I really like the new soft look of your blog!